This archive holds all posts form March 16, 2010. Robert Stacy McCain, a former key Washington Times editor who has suggested that “perfectly rational people” react with “altogether natural revulsion” to interracial marriage, apparently has returned as a free-lancer to the newspaper he left in January 2008. In a “Special to The Washington Times” article published today, McCain covers a congressional race in upstate New York involving a candidate with connections to the Tea Party movement. A casualty of the housecleaning that occurred at the Times three years ago, McCain left the paper on his own accord after managing editor Fran Coombs, with whom he was close, was terminated (Coombs had his own connections to white supremacy). Once identified as a member of the neo-Confederate hate group League of the South, McCain’s reporting while at the Times was always controversial. As editor of the “Culture Briefs” section of the paper, McCain used excerpts from racist publications including American Renaissance magazine and the anti-immigrant hate site VDARE.com. In fact, McCain may be the only mainstream newspaper reporter to have covered four American Renaissance conferences. Twice, he offered no description at all of the group he was covering, which is devoted to race science. Once, he said it was “critical of liberal positions on race and immigration.” Only in 2004 did he note that some viewed it as racist. While conservative-leaning, the Washington Times is mainstream news outlet, and the re-hiring of McCain – a man with clear ties to overt white supremacist groups – is a noteworthy step toward mainstreaming white supremacy and rendering these kinds of views more acceptable. The mainstreaming of white supremacy is not new. 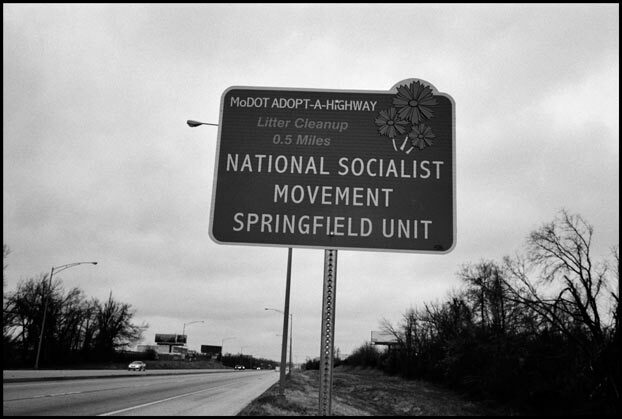 White supremacist groups in the U.S. since the 1970s have tried a number of strategies to make their views seem more acceptable and their agendas appear benign, such as changing hoods-and-robes for suits-and-ties to participating in the “adopt a highway” program. The fact is, even apart from these sorts of efforts, the white supremacist ideology resonates beyond these extremist groups. This is an argument I highlighted in my first book (White Lies, Routledge, 1997). While many people may find the idea of white supremacist ideology an anachronism in the post-civil rights era, the fact is that the views of extremists are reflected in mainstream American culture. For example, the idea that white people – and specifically white men – were the primary force behind building the U.S. (as illustrated in this image from a racist publication) is one that resonates with large portions of the population and is widely repeated by leading news commentators on mainstream news channels. Other examples include when extremely popular shock-jocks such as Don Imus and Howard Stern boost their already-considerable ratings by villifying young, black women. Who needs to bother with joining a white supremacist group when you can listen to Buchanan, Imus and Stern spout the same ideas? The second story is from Newsweek, which argues that white supremacists are “rebranding hate for the Obama era.” The Newsweek story (released on the web March 12 and set to be released in print on March 22) is a good bit of reporting about extremists groups by reporter Eve Conant and photographer Bruce Gilden. They visited two groups on the Southern Poverty Law Center’s hate group list: the Knights Party, an offshoot of the Ku Klux Klan (during a cosponsored event with the Christian Revival Center), and the Detroit-based National Socialist Movement (NSM), one of the largest neo-Nazi groups in the U.S. However, I’m not that persuaded (and don’t think most readers of Newsweek will be) of their argument about the success of these groups at “rebranding hate.” The photo essay by Gilden (from which the image above is taken) is compelling but somewhat at odds with the text of the article. The people photographed do not, I would argue, fit the image of “mainstream” but rather trade on notions of white supremacists as “other,” as extremists not at all like most Americans. It’s an interesting tension. This, too, is something I’ve noted in the earlier work (White Lies, Routledge, 1997). At the time, television talk shows regularly featured white supremacists as sure ratings-boosters. Providing white supremacists with this kind of platform – whether in fiction or non-fiction television – contains the threat of white supremacy by identifying specific targets (“those are the white supremacists – there”) while it simultaneously lets other whites off the hook. So, the not-so-subtle message gets conveyed that those of us sitting at home watching white supremacists on the television have nothing to worry about. What’s remarkable here is that two mainstream news outlets – the Washington Times and Newsweek – are calling our attention to the mainstreaming of white supremacy (although there’s clearly a difference of intention and political allegiance between the two news organizations). The question is how will the rest of the U.S. respond to this attempt to ‘rebrand’ hate?